The U.S. and its Arab and European allies agreed on Saturday to do more to help the embattled rebels trying to oust Syrian President Bashar Assad, U.S. Secretary of State John Kerry said. While he offered no specifics about stepped-up military and humanitarian aid, Kerry said the assistance would help change the balance on the battlefield of the civil war where regime forces have scored recent victories. At a meeting of nearly a dozen of his counterparts, Kerry blamed Assad for the deteriorating situation in Syria where more than 93,000 people have died in a two-year civil war. He denounced Assad for inviting Iranian and Hezbollah fighters to battle alongside his troops and said the Syrian president risked turning the war into a regional sectarian conflict. Kerry met with his counterparts in the Qatari capital on the first stop of a seven-nation trip through the Mideast and Asia where he is tackling difficult foreign policy issues — from finding peace between the Israelis and Palestinians to trying to gain traction on U.S. talks with the Taliban to end the Afghanistan war. James Dobbins, U.S. special envoy to Afghanistan and Pakistan, arrived in Doha on Saturday, but talks with the Taliban have not yet been scheduled. Kerry seemed to put the ball in the Taliban's court, saying the Americans and Qataris were all on board to help negotiate a political resolution to the war and it was up to the Taliban to come to the table at a new political office they opened last week in Doha. "We are waiting to find out whether the Taliban will respond," Kerry said. "We will see if we can get back on track. I don't know whether that's possible or not," Kerry said. "If there is not a decision made by the Taliban to move forward in short order, then we may have to consider whether the office has to be closed." Kerry has been pressing hard on Russia to back an international conference intended to end the bloodshed in Syria and allow a transitional government to move the country beyond civil war. Russia has been the key ally of Assad's regime throughout the two-year conflict. Top U.S. diplomats are ready to go to Geneva to meet with Russian Foreign Minister Sergey Lavrov and other officials in coming days to advance the political process, Kerry said. Kerry, a long-time proponent of more aggressive action in Syria, believes the international community must urgently try to stop the civil war in Syria. With Obama's decision to send the rebels arms along with humanitarian and other nonlethal aid, it appears that Kerry and like-minded U.S. officials have won over those who are more wary of sending weapons and ammunition into a war zone where they could fall into the hands of Islamic extremists. It was Kerry's first meeting with his counterparts about aid to the Syrian rebels since President Barack Obama announced that the U.S. would send lethal aid to the opposition. That decision was partly based on a U.S. intelligence assessment that Assad had used chemical weapons, but Kerry expressed deeper concern about Iran and Hezbollah fighters. "That is a very, very dangerous development," Kerry said. "Hezbollah is a proxy for Iran. ... Hezbollah in addition to that is a terrorist organization." Kerry blamed Hezbollah and Assad with thwarting efforts to diffuse sectarian rebels and to negotiate a settlement. "We're looking at a very dangerous situation," that had transformed "into a much more volatile, potentially explosive situation that could involve the entire region," Kerry said. Syrian government forces stepped up their attack against rebel strongholds north of the capital Damascus on Saturday, while opposition fighters declared their own offensive in the country's largest city Aleppo. Jordan welcomes U.S. military Jordan's prime minister says the country is hosting 900 U.S. military personnel to bolster its defense capabilities against potential threats from the Syrian civil war. The first Jordanian public official to speak publicly of the numbers of U.S. troops in the kingdom, Abdullah Ensour told reporters Saturday that 200 of the personnel were experts training for how to handle a chemical attack. He said the remaining 700 are manning a Patriot missile defense system and F-16 fighter jets which Washington deployed this month in case the Syrian war worsens. Jordan is concerned its larger northern neighbor would use chemical weapons against Syrian refugee camps in Jordan and other neighboring countries, or that the stockpile may fall into the hands of al-Qaeda or other militants if President Bashar Assad loses control. 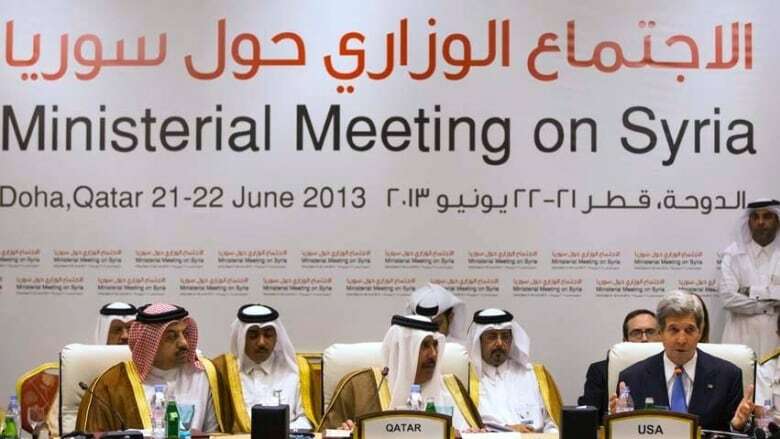 Both sides intensified operations as an 11-nation group that includes the U.S., dubbed the Friends of Syria, began meeting in Qatar to discuss how to coordinate military and other aid to the rebels seeking to oust Syrian President Bashar Assad. The Britain-based Syrian Observatory for Human Rights, which relies on an extensive network of activists in Syria, said the shelling of the district of Qaboun has killed three children, including two from the same family, since Friday. Activists reported heavy shelling on many fronts on districts north of Damascus, apparently an attempt to cut links between rebel-held districts that have served as launching pads for operations against the capital. The Lebanese TV station Al-Mayadeen, which had a reporter embedded with Syrian government forces in the offensive, quoted a military official as saying that the operation aims to cut rebel supply lines, separate one group from another, and secure the northern entrances to the capital. The regime's forces have struggled for months to regain control of these suburbs. The Observatory said the neighborhood was being attacked from several different sides, while the shelling has caused structural damage and started fires. Activists from Qaboun posted on Facebook that government forces had brought up new tanks to reinforce its positions outside the neighborhood, and the bombardment had brought buildings down. 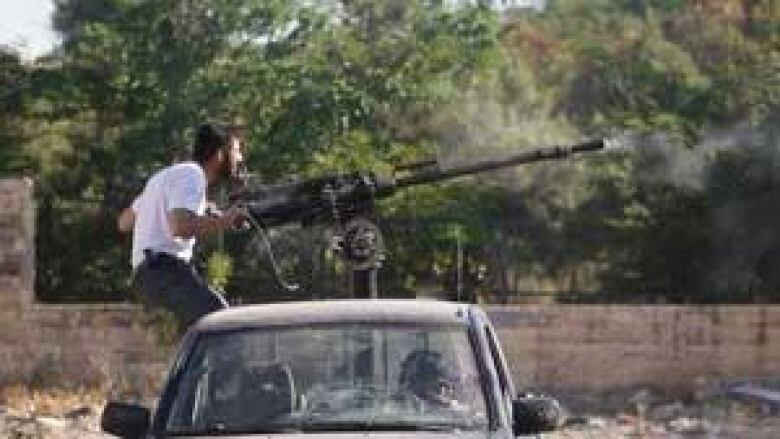 The Observatory said rebels targeted a police academy in the nearby Barzeh area Saturday, pushing back against a government attempt to storm the neighborhood. One rebel was killed in overnight fighting, it said. A recent declaration by the U.S. that it had conclusive evidence that President Bashar Assad's regime used chemical weapons on a small scale against opposition forces prompted Washington to authorize the arming of rebels, a major shift in policy. The decision also followed advances by the government forces aided by fighters from Lebanon's Hezbollah. Rebels say they have already received new weapons from allied countries— but not the U.S. — that they claim will help them to shift the balance of power on the ground. Experts and activists said the new weapons include anti-tank missiles and small quantities of anti-aircraft missiles. It was not clear if any of the new weapons have made it to the Damascus area. A spokesman for one of the main groups fighting outside of Damascus, the al-Islam brigade, said his group had none of the new weapons. The unnamed spokesman spoke to The Associated Press through Skype. He said government forces were shelling Barzeh from Qasioun mountain overlooking Damascus. Syria's main Western-backed opposition group said Thursday that 40,000 civilians in the two northern districts of Damascus are suffering from shortages of food and medical supplies. Rebels and government also clashed in and around the northern city of Aleppo, where government forces announced an offensive earlier this month. Activists said troops clashed in the southern neighborhoods of Rashideen and Hamdaniya and in the western suburbs. The Observatory said rebels pounded a military academy in the area, causing a fire in the compound. There were no immediate reports of casualties. In Rashideen, rebel forces have pushed government forces out from parts of the neighborhood, according to the local Aleppo Media Center network and posts on Facebook. A statement by a coalition of rebel groups, posted on the Center's page, declared that the fighters are launching a new operation to seize control of the western neighborhoods of Aleppo. Amateur showed what appeared to be intense government shelling of villages in the area. On Saturday, a dozen shells from Syrian forces landed in a northern Lebanese border town, some landing near homes, causing a panic among residents, the Lebanese news agency reported. 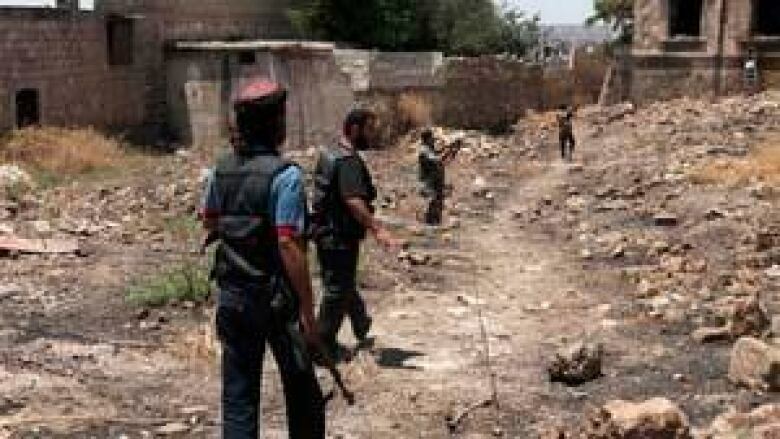 Syria's official news agency said government troops were targeting a group of infiltrators across the border. It gave no further details.